France is being warned about how to avoid tick bites, as the insects have been spotted spreading across the country already due to a mild few weeks and rising temperatures. Ticks can transmit diseases, including Lyme disease, which can be debilitating if not caught early and properly treated. The insects have become more common in France in recent years, as people’s travelling habits change - including travelling more frequently, and further afield - and our climate becomes warmer. Now, Nathalie Boulanger, a researcher and professor at the University of Strasbourg, has issued some advice on how to avoid being bitten or irritated by ticks. The best way to avoid bites is to know how to avoid ticks in the first place. They tend to be found under piles of leaves or around forest vegetation after emerging from winter hibernation, from March onwards. They can be found in wooded areas, and around wild animals, as well as in green spaces in towns and cities. Even if you are not able to avoid these areas completely, it is advisable to wear clothes that cover up as much skin as possible, preferably in light colours so that the insects can be seen on the fabric. Tucking in loose trousers and sleeves to avoid the insects from being able to crawl up inside your clothes is also recommended, and small children are advised to wear hats to avoid being bitten on their scalp (as they are closer to the floor). Some anti-insect sprays or creams can be used to try to avoid bites, although the effectiveness of some anti-mosquito products against ticks is still being debated, and research by the World Health Organisation (WHO) is still ongoing. Anti-tick products do not kill the insects, but try to keep them away from your skin. Eucalyptus extract (PMD, corymbia citriodora); DEET (diethyl toluamide) - although this has been controversial due to its strength and toxicity; IR35/35 (N-butyl, N-acetyl-3 ethyl amino propionate); and KBR 3023, also known as picaridin (1-piperidine carboxylic acid). Some other natural products are thought to offer some protection, but research is still inconclusive. These include 2-undecanone (BioUD), which comes from tomatoes; decanoic acid (Contrazek), a kind of coconut or palm oil; geraniol; neem tree extract; and lavender extract. Some anti-insect products can be applied to clothes, rather than skin - including permethrin - but its use is advised with caution, as it can be toxic to animals, especially domestic cats. Other methods, such as other essential oils or “anti-tick bracelets” are not thought to be effective. Keeping a clean and clear outdoor space can help prevent the prevalence of ticks in your surrounding areas. This includes clearing away dead leaves or fallen vegetation, and keeping grass as short as possible. In more rural areas, effective fencing can also keep away deer and game - some of the major carriers of ticks. It is also a good idea to keep an eye on pets and domestic animals, as they can also attract ticks in their fur. Ticks do not have any major predators, although they can be eaten by birds, or killed by wasps, certain mushroom spores, and some pesticides. No natural method of destroying them in a large scale way has yet been found. It is advisable to check skin, hair and clothes after having spent time in an at-risk area, such as a wood or a green space with long grass or piles of leaves. 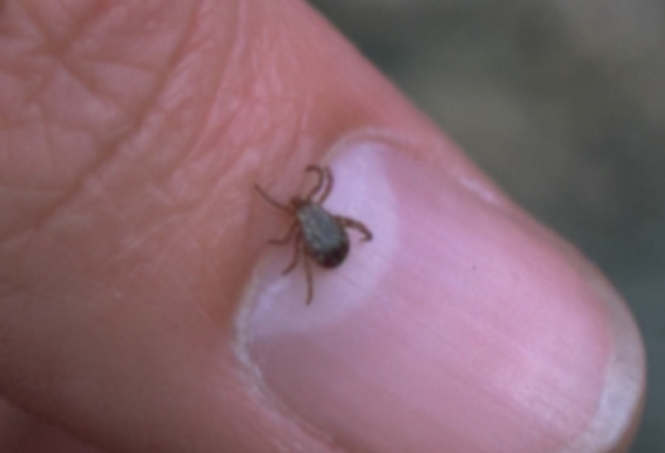 Ticks may head for warm folds of skin, including armpits, elbow creases, thighs, nostrils, ears, and scalp. If you see a tick, it is important to remove it physically as quickly as possible, using a special “tick hook” or a simple pair of tweezers. Do not try to spray it with excess anti-insect lotion or similar while it is still on your clothes or body, as this has been shown to be ineffective. Once you have taken the tick away, stick it onto a piece of heavy-duty tape or sticky insect tape, wrap it up, and throw it away. If you suspect that you have been bitten, double check the area. Bites from larvae are more difficult to see than those from larger ticks; and can measure just 1-3mm. It is important to monitor the bite area for at least one to three months afterwards, and take note of any changes. 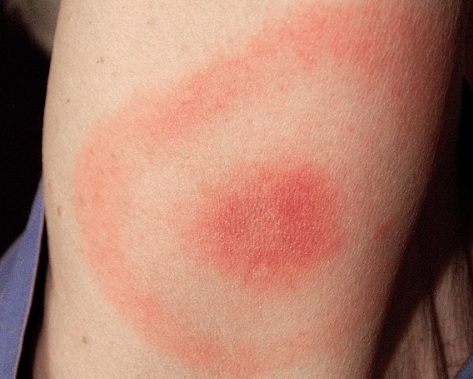 If the actual bite becomes red, inflamed, or enlarged, or develops a ringed rash, this may be the first sign of Lyme disease. If this happens, and/or any other symptoms show up - such as a high temperature, feeling shivery, joint pain, headaches or unusual tiredness - you are advised to consult a doctor as soon as possible, making sure you inform them of the bite.